Australian owned and operated since 2012, Pampered Petz is a luxury pet store located in Hornsby. Situated within a prominent Westfield shopping centre complex, the store creates an exciting new pet shopping experience. The interior design was heavily influenced by the company’s slogan “My Pet, My Family”. Taking inspiration from the idea of pets as part of the family, the design concept of ‘the family home’ emerged. Elements that are reminiscent of a traditional family home were introduced into the space making it easy for customers to picture the pets and pet products within their own homes. In turn, this creates a relaxed atmosphere in which customers feel comfortable shopping at leisure and interacting with their possible new family members. 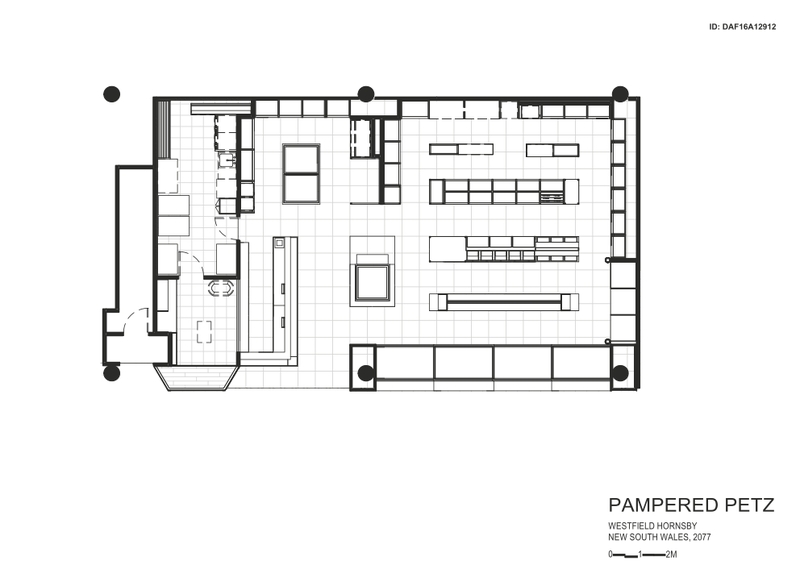 Each interior zone has been inspired by a common space within a home. Blending the concept with the functional needs of a pet store, the interior zones became an ingenious source of easy way-finding. For example, the ‘bedroom’ inspired zone within the store is where all pet beds are located, whilst the ‘kitchen’ inspired zone is where all pet food and pet bowls are located. The design brief for the fit-out was a contemporary, fresh and homely interior, influenced by the desire to provide customers with a luxurious, high-end pet shopping experience. The store aims to stray away from the normal pet store interior and the negative connotations associated with them. As the store is based around the concept of the family home, it was extremely important that the pets are at easily accessible heights for both adults and children. The large scale of the shop front inspired an exaggerated, whimsical design. The right hand side is an oversized interpretation of the typical family home staircase balustrade; an homage to children playing under the stairs with their pet and best friend. A warm colour palette of soft, earthy, natural materials such as limestone and timber have been implemented to create a welcoming, family-friendly atmosphere. 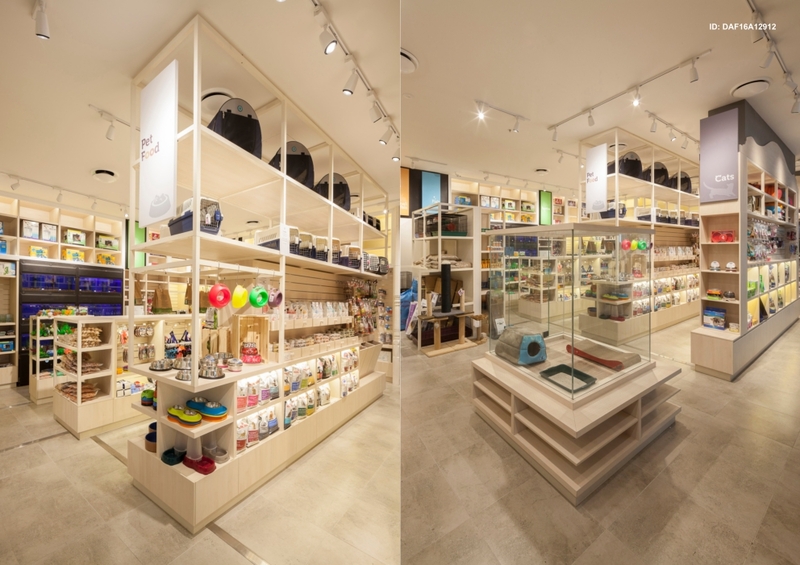 The biggest source of innovation within this project was re-thinking and re-imaging the common-place pet store. 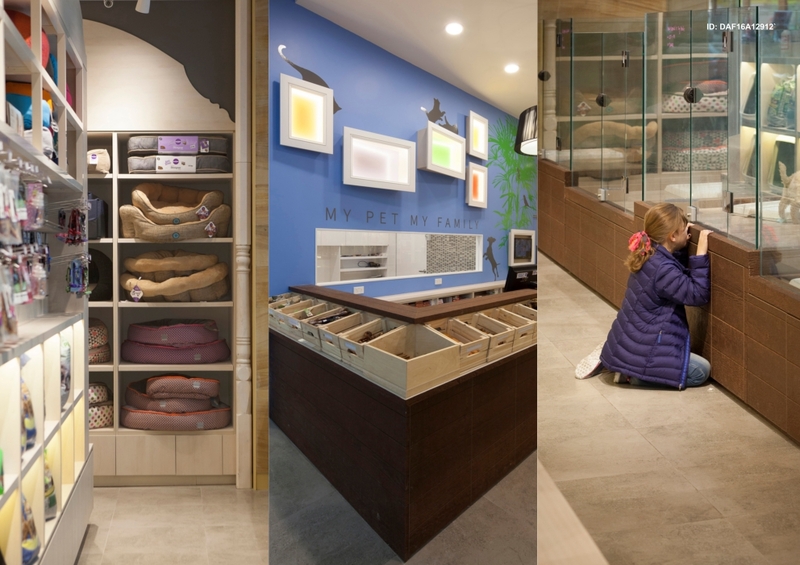 The project required vigorous research into the functional display and storage requirements of a pet store, as well as pairing that with the best interior layout for the pets quality of life. The glazing in the animal enclosure areas have been reduced in height in order to allow for a generous, airy pet living environment. This also increases the interaction between pet and possible new owner/family member. To enhance the levels of interaction the animals have been raised up from the ground, perfectly situated at a child’s eye level. On the outer side of the enclosure, a ledge has been placed encouraging people to sit with the animals for an extended amount of time. Overtime, pictures of purchased pets and their new family members will fill the frames located above the front counter.